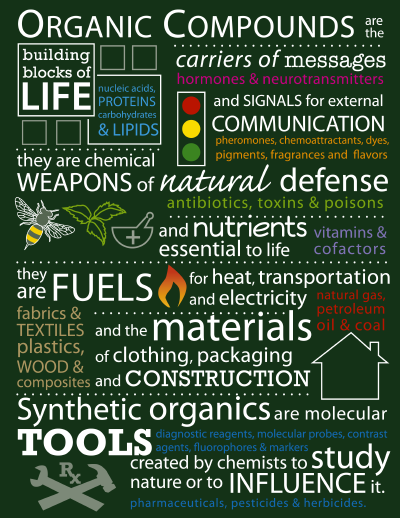 Great Technology or Bad for Human & Bovine Health? BST, bovine somatotropin, this three letter acronym comes with a lot of controversy and misunderstanding. 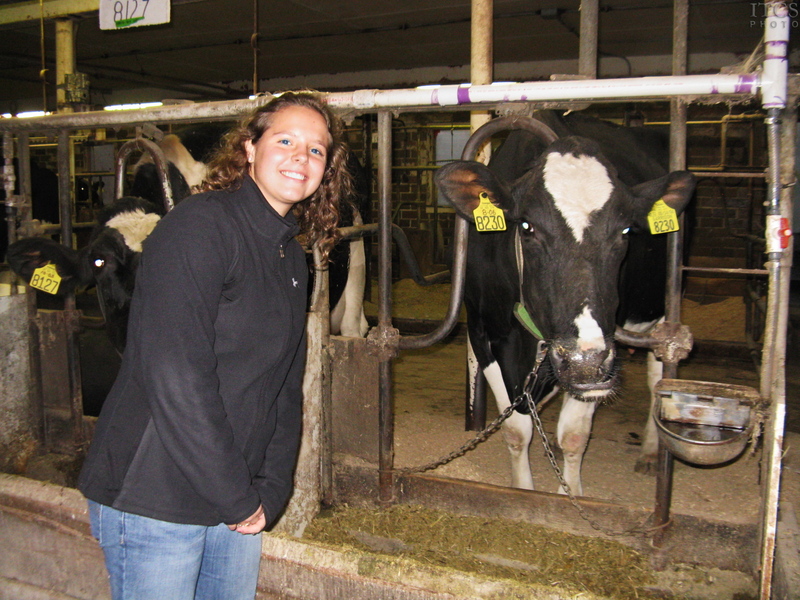 Being an Animal Sciences major, I am always interested in new technology used in animal agriculture, and I also like to know the truth about the technology, and not just public perception of the technology. It was first discovered in the 1930s that bST could be injected into lactating dairy cows to increase milk production. 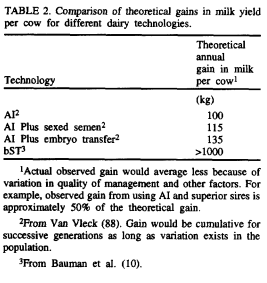 The first studies published about the effects of bST on dairy cows were performed in 1937 by Russian scientists. Monsanto was the company that introduced rBST, or recombinant bovine somatotropin, to the United States and sparked mass controversy among consumers. Many consumers fear the side effects of rBST on humans, and the cows who are injected with it. Originally, bST was not used in agriculture because the only way to get it was from bovine cadavers. Monsanto found that they could produce bST synthetically by genetically engineering E. coli. 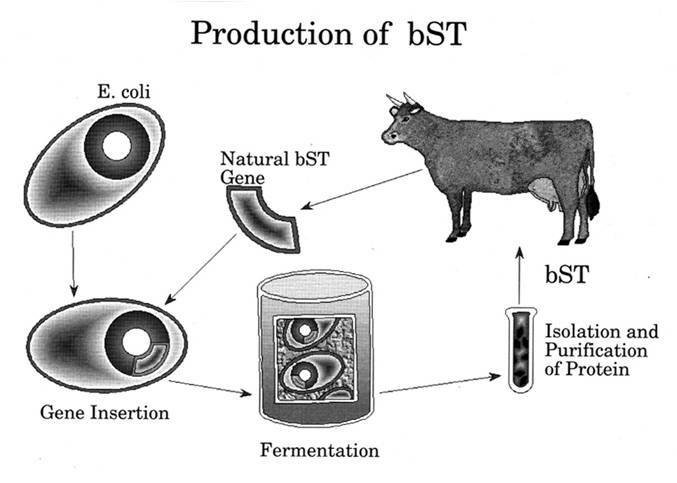 They injected the gene that encodes for the protein sequence of bST into the DNA of the E. coli, so that when the E. coli replicated they would reproduce more bST. They then separated the bacteria from the rBST, and then purified the rBST to make an injectable hormone (Figure 1). RBST differs from bST slightly because the manufacturing process adds a couple extra amino acids. Depending on the type of manufacturing process, the number of amino acids added can range from 0 to 8. The advancement in the production of synthetic bST allowed the commercial use of the hormone in the dairy industry. The FDA, Food and Drug Administration, approved the use of bST in the United States in 1993. Next, we need to understand how bST is able to increase milk production in dairy cows. I mentioned before that somatotropin is a key controller of nutrient use. Somatotropin’s mechanism of action involves a series of changes in the metabolism of body tissue, so that more nutrients can be used for milk synthesis. The adjustments in metabolism are major, and of critical importance during the initial period of bST use, when milk yield has increased but dry matter intake has not increased. We need to understand the physiological effects on mammary, liver, muscle, and kidney, but also we need to take a look at the whole body. Overall, mammary uptake of all milk precursors increases while the metabolism of other body tissues is altered, so that a greater proportion of nutrients can be used for milk synthesis. The mammary tissue, increases the synthesis of milk with normal composition and increases the uptake of all nutrients used for milk synthesis. Also the mammary epithelial tissues increase in activity per cell. There is an increase in blood flow in the mammary tissue, which is important since it takes 500 units of blood to make 1 unit of milk. In the liver, there is an increase in the basal rate of gluconeogenesis, and there is a decrease in the ability of insulin to inhibit gluconeogenesis. The muscles decrease their uptake of glucose. The kidneys increase their production of vitamin D3. The intestines increase the absorption of minerals required to make milk, such as calcium and phosphorous. There is also an increase in calcium binding protein and an increased ability of vitamin D3 to stimulate calcium binding protein. There is an increase in energy expenditure and cardiac output, which is consistent with an increase in milk yield. There is also an overall increase in productive efficiency, which is the milk per unit of energy intake. At this point, you might think that bST is magic and that everyone should use it because of the increase in milk yield, persistency, and productive efficiency, but bST is not magic. After countless studies, it has been shown that the most important factor affecting the magnitude of milk response to bST is the quality of management for the herd. The overall management program includes the herd health program, milking practices, nutrition program, and environmental conditions. It is kind of intuitive that if you want high producing dairy cows, you need to be taking care of your cows like they are high producing dairy cows. If cows don’t have a good nutritional program, they won’t have the nutrients available so that their bodies will be able to absorb the nutrients more fully. Who cares if your nutrient absorption increases if there are no nutrients to be absorbed? There was a study performed by McCutcheon which showed that even if the herd wasn’t managed well, the cows didn’t have poor health, they simply had negligible milk yields. The general public needs to understand that unhappy, unhealthy cows do not produce a lot of milk. Since the dairy farmer needs to make money off of his cows, it makes sense that he would want to give his cows the highest level of care, so they can produce the most milk possible. On a dairy farm, what is the typical protocol for administration of bST to a herd? The typical dose used on a dairy is 10-50 mg/d. Researchers have found that the maximum milk response was achieved at a dose of 30-40 mg/d, and after that level there was no increase in milk production if you increased the dose. The first few days after starting treatment milk yield increases, and the maximum milk yield is usually reached by the sixth day. Even after the sixth day, exogenous bST must still be injected every day to continue the increased milk response because bST is cleared rapidly from the blood stream and it is not stored in the body. If the farmer doesn’t want to be giving shots every day, he can also get a slow release formula of bST, so that he can possibly skip a day of administering shots. BST also increases milking persistency, which means cows continue to give a higher milk yield for a longer period of time. An important concept to understand is that when a cow is beginning her lactation, after she has calved, she will be producing the most milk each day. At some point, she will reach her peak milk, which is the most milk she will ever give for that lactation. Through research, it has been suggested that it is best to start treating with bST after a cow’s peak milk is reached. Researchers have found that giving bST at the beginning of a cow’s lactation really doesn’t show a great gain in milk yield. They see the greatest gains in milk yield by administering bST after a cow has reached her peak milk. Although bST has tremendous positive effects on milk yield, it does have some negative effects on reproduction. It is important to keep in mind that a cow is not going to try to reproduce if she doesn’t think she has enough energy to successfully care for herself and her offspring. Since the cow is now putting all her energy and nutrients towards an increase in milk production, it is not unreasonable that she won’t be wanting to try to reproduce because she just doesn’t have enough energy to do both. With bST, there is sometimes a decrease in pregnancy rate, but not in conception rate. There is also an increase in days open, which means the cow will not be pregnant for a longer period of time. Along with this, the calving interval increases, which is the amount of time between calves. The normal calving interval is 13 months, but on bST the calving interval is usually 14 to 15 months. One of the biggest fears of consumers is that cows treated with bST, will produce milk that is very different in composition compared to cows that were not treated with bST. In actuality, the composition of milk doesn’t change with the use of bST. Even in cows that aren’t treated with bST, there are still trace amounts of bST in their milk, because cows produce bST on their own. Also the levels of bST in the milk of treated versus not treated cows is not very different either. Since most of our milk is pasteurized in this country, the majority of the bST that does make it into the milk becomes denatured during pasteurization. Consumers are also concerned about the health effects bST will have on cows. Of all the studies that have been done on bST, there has never been one where an adverse health effect was observed. There is actually a tie between somatotropin and the maintenance of the immune system. A study done by Burvenich showed that cows supplemented with bST recovered more rapidly from experimentally induced E. coli mastitis than cows that were not treated with bST. The last positive aspect of bST I want to mention is that environmental pollution is reduced with bST. Since more nutrients are getting absorbed, there is less cow manure. There is also less methane production for the cows. The amount of methane produced by dairy cows on bST is reduced by 5.5% per unit of milk produced. Milk production costs are also lowered because cows are making their milk more efficiently. With bST use, a unit of milk is produced with less feed and protein supplement and with a reduction in animal waste. In conclusion, bovine somatotropin is a protein hormone that increases the absorption of nutrients to increase milk yield, milk persistency, and milk efficiency. BST increases milk yield while keeping the animal normal and healthy. It increases nutrient absorption by altering the metabolism of tissues in the body. It also decreases the environmental impact of dairy cows. Lastly there are no adverse health effects associated with bST use, but it could have a negative impact on a cow’s reproductive success. It also does not have a biological effect on humans because our receptor for somatotropin is a completely different shape than the receptor for bST. When bST enters the human body it gets broken down by the stomach into amino acids, which are then absorbed. In order for a dairy producer to see the most increase in milk yield, he must offer his cows the highest level of care so they can put all their energy into milk production. I hope that this has shed some light on the highly controversial issue of bST use in dairy cows. Hopefully, this will teach consumers to look at new technology from a scientific background, and to not just make assumptions but to actually listen to scientific data. Bauman, Dale E. "Bovine Somatotropin: Review of an Emerging Animal Technology." Dairy Science Journal. (1992): n. page. Web. 18 Apr. 2012. <http://download.journals.elsevierhealth.com/pdfs/journals/0022-0302/PIIS0022030292781193.pdf>. Soderholm, C.G., D.E. Otterby, J.G. Linn, F.R. Ehle, J.E. Wheaton, P. Hansen, and R.J. Annexstad. 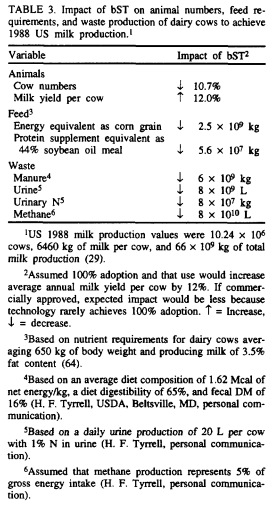 "Milk Production, Body Composition, and Physiological Parameters." Dairy Science Journal. (1998): n. page. Web. 18 Apr. 2012. <http://download.journals.elsevierhealth.com/pdfs/journals/0022-0302/PIIS0022030288795648.pdf>. Tucker, H. Allen. 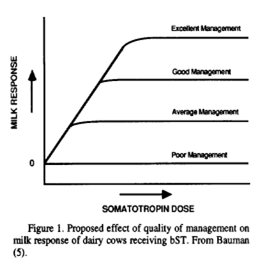 "Safety of Bovine Somatotropin (bST). "University of Illinois Extension. Cooperative Extension System, 30 Apr. 2010. Web. 18 Apr 2012.